Thailand’s opposition leader Abhisit Vejjajiva has called for elections scheduled for July to be pushed back by up to six months. In a 10-point package of proposals, Abhisit Vejjajiva said PM Yingluck Shinawatra and her government should resign, allowing an interim cabinet to oversee a referendum on reforms. Yingluck Shinawatra has not responded to the proposals yet. Thailand has been in political deadlock since anti-government protests began in Bangkok in November 2013. Yingluck Shinawatra’s government announced the July 20 polls after a previous snap election in February was declared unconstitutional. The ruling Pheu Thai party had been expected to win the February vote. However, the opposition boycotted the polls and protesters disrupted voting. At the height of the anti-government demonstrations, protesters shut down key road junctions and blockaded government ministries. Their number has since declined. On Saturday, Abhisit Vejjajiva said his opposition Democrat party would not contest July’s polls. The current government resigns and a non-partisan interim government is appointed. 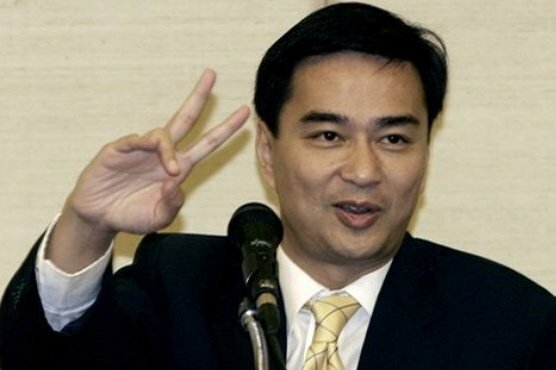 Abhisit Vejjajiva acknowledged that he and his Democrat party were partly responsible for the political mess Thailand was in, and said he was offering a way out. Yingluck Shinawatra faces a court verdict next week which could result in her being barred from politics for five years, a result her supporters say they would view as tantamount to a coup. Pheu Thai party and Yingluck Shinawatra remain very popular in rural areas.